John Charles Frémont was born in Savannah, Georgia in 1813. Though poor, through the efforts of a family friend, John Charles was prepared for and entered Charleston College at the age of 16. In one year he had advanced to the Junior Class, and though he showed great promise in languages, science, and mathematics, a few weeks before graduating he was expelled for non-attendance. He early worked as a schoolteacher, teacher of mathematics, and surveyor. Attracting the attention of Joel Poinsett (former Senator, Ambassador to Mexico, and later Secretary of War) Frémont was commissioned as Professor of Mathematics in the Navy. The appointment convinced Charleston College to then confer upon him the degrees of Bachelor and Master of Arts. He was assigned to the Frigate Independence, where he taught mathematics to midshipmen--there not yet being a Naval Academy at that time. In 1837, at the age of 24, he was appointed a civil engineer in the Army Topographical Corps of Engineers by President Jackson. A number of government and railroad surveys followed. In 1838 was commissioned as Second Lieutenant of Topographical Engineers. In 1838 and 1839 he was assigned to a survey of the area between the upper Missouri and Mississippi Rivers under Joseph Nicolas Nicholet, an eminent French astronomer and mathematician. He had also become attracted to the 15 year old daughter of the powerful Missouri Senator Thomas Hart Benton. The attraction was mutual, but Jessie Benton's age, and Frémont's birth and Army career, made him unsuitable as a suitor. The Nicholet survey, and an 1841 survey of the Des Moines River, kept Frémont conveniently apart from Jesse. But on his return the two became secretly married. Senator Benton was furious over the marriage, but soon became reconciled to the union, and thereafter used his influence at every opportunity to promote Frémont's career. This came soon, in 1842. Because of ill health, Nicholet was unable to conduct a mapping expedition of the Oregon Trail to the Rockies through the South Pass. The command fell to Frémont. Now known as Frémont's First Expedition, the results were a great success, and the report written in a narrative form by Frémont with the assistance of Jessie, was published by Congress in 1843 and appeared in all major newspapers. The Report made Frémont known and also introduced Christopher "Kit Carson" to the American public. Frémont's Second Expedition was an even greater success. It included many men from his First Expedition, including cartographer Charles Preuss, and Kit Carson. Dividing his men, he sent most of the expedition along his previous route under mountain man and trapper Thomas "Broken Hand" Fitzpatrick. Frémont traveled a new route to include the first mapping and exploration of the Great Salt Lake. Reuniting the party at Fort Hall, he then continued on to Fort Vancouver, tying his survey in to the recently completed Wilkes Coastal Survey. The Expedition then moved south through what is now central Oregon and western Nevada arriving a what Frémont named Pyramid Lake. It was mid winter, and being low on supplies, he decided to cross the Sierra Nevada to Sutter's Fort on the Sacramento River. This turned into a monumental effort, but was ultimately accomplished. Every detail of this mountain crossing is covered in The Crossing described on this site. Traveling south through the Sacramento and San Joaquin Valleys, the Expedition joined the old Spanish Trail, from which it later turned north and returned to Missouri. The Report of this expedition, after an initial printing of 20,000 copies by the Senate and the House of Representatives, was published world wide. The map of 1845 produced and published with the report was the first accurate map of the region west of the Rocky Mountains, and was the basis of later maps of the area for many years. Frémont was now a national hero, as was Kit Carson. Second Lieutenant John Charles Frémont, now popularly known as "The Pathfinder", was awarded a double brevet in rank. The next year, Captain John Charles Frémont left Missouri on his Third Expedition. The goal of this expedition is less clear. The United States was on the verge of war with Mexico over the annexation of Texas. It was feared that in the event of war, California, removed from Mexico and beyond Mexico's ability to protect, might fall under the protection of England or France. Mexico owed England a large war debt from their own war of independence. That and the unsettled joint occupation of the Oregon Territory by the United States and England seemed to require a military presence in California. The first California Volunteer Militia was organized by, the man historical writings refer to as "The Pathfinder. This same individual later became one of the State's first Senators and was appointed a Major General in the Union Army during the Civil War. 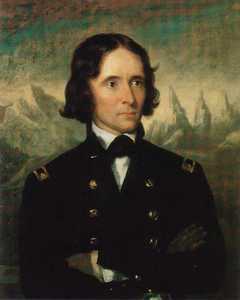 This man was Captain John Charles Fremont, U.S. Army topographer, explorer, and trail blazer. Captain Fremont began his treks westward into United States trerritory and beyond in 1842. It was during his third expedition (1845-1846) that he assisted in turning the course of history in California. In December 1845, Captain Fremont, and a force of sixty men, entered into the Mexican province of Alta California ostensibly to map the west coast area. Although he officially made contact with Mexican authorities, his movements around the province was a point of consternation to Mexico's Northern Regional Commander, General Jose Castro. In particular, the latter did not care for Fremont's contact and sympathy for American settlers and emigrants. The Fremont Party having traversed the territory as far north as Klamath on the California/Oregon border, turned south upon hearing that a proclamation had been issued by General Castro, aimed at driving out foreigners from the province. Fremont, though sympathetic could not commit U.S. Forces to aid the settlers. Nevertheless, he did decide to stay and advise those who chose to confront the Mexican authorities. Captain Fremont established his base camp at the base of four buttes (Sutter Buttes) in the Sacramento Valley a few miles north of John Sutter's Fort. Word of the camp reached a group of settlers who were most vociferous in their dislike of the province's government. Leader of this group calling themselves Osos (Spanish for Bears), was Ezekiel "Stuttering" Merritt. Merritt was well known in the territory, and the west, for having been a fur trapper in the Rocky Mountains. Captain Fremont gladly accepted the twenty Osos, and went so far as to appoint Zeke Merritt a lieutenant of the irregulars. Fremont remained in the background of events, not wishing to involve the United States in any altercations the Osos might be involved in; however, he and his force had already been branded "bandits" by General Castro, after an alleged horse stealing episode near Salinas during May 1846. Hence, in early June, Captain Fremont gave advice to capture the Northern Headquarters of General Mariano Vallejo at Sonoma. On June 14, the Osos took the town of Sonoma in the early dawn light without firing a shot. And with the acceptance of General Vallejo's surrender the Osos declared California a Republic, and raised the Bear Flag over the plaza. Captain Fremont saluted the Bear Flaggers, whose force now numbered ninety, when both the flag of the United States and California Republic were raised on July 4, 1846, in celebration of United States and California Independence. Following the celebration, Captain Fremont proposed that a unified force be organized, under his command. A discussion was held July 5, with William Brown Ide (Grigsby-Ide emigrant party of 1845), who the Bear Flaggers had elected as their Commander-in-Chief. A compact was drawn up for all volunteers to sign, which in part read: Not to violate the chastity of Women; conduct their revolution honorably; and pledge obedience to their officers. With the signatures or marks of the men, the California Battalion was formed. Fremont appointed a Marine Corps Officer, Captain Archibald H. Gillespie, his Adjutant. Captain Gillespie had joined Fremont when the latter was at the Oregon Border. Gillespie had crossed the Mexican nation and entered California about the time hostilities broke out with the opening of the Mexican War, May 1846. Fremont requested the Battalion's volunteers to elect their officers from the ranks. Chosen were: Richard Owens, John Grigsby, Granville P. Swift, and Henry L. Ford. The California Battalion was given further legitimacy when on July 23, it was recognized by the American military leader in California, Commodore Robert Field Stockton, Commander of U.S. Naval Forces in the Pacific. J.C. Fremont was promoted to Major by Commodore Stockton, and given command of all Volunteer Militia. Major Fremont and the California Battalion eventually came under the command of Brigadier General Stephen Watt Kearney. Following this command change the Battalion came into prominence when in January 1847 they accepted the surrender of the Californios, thereby ending the conflict in California. From the ashes of his camping sites have sprung cities. John Charles Fremont (1813-1890), nicknamed "the Pathfinder" in recognition of his groundbreaking expeditions to map the American West. An amazing explorer, controversial soldier, and a failure as a Civil War general and a businessman. Kit Carson 1809 - 1868 Explorer/mountain man who rode with Fremont across the Mojave.